Your overall health and your smile might depend on a set of great dentures, and that’s what we like to make sure you get here at Vestal Dental Associates. When you are happy with your smile, you are happy with life and we like to be a part of that. Dentures are not always something that our patients accept, but that does not mean they aren’t worthwhile. Dentures are very necessary for some patients, and recommended for others. Getting comfortable with the decision is one that sometimes takes a while. We know this, and we understand this. 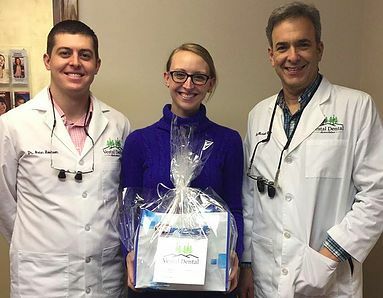 That’s why we like to ensure that our patients are able to fully comprehend just how important it is for them to have the kind of dental professionals we staff here at Vestal Dental Associates. Our dentists understand that a life changing decision such as getting dentures is not something people are always comfortable with, which is why we like to be here for you when you want to discuss your option. There are several reasons that you should get dentures if your dentist recommends it. Every patient is different, and that means every case is different. The reason you might need dentures could vary greatly from the reason others need dentures. What matters is that you know that there are always good reasons to do something that makes you feel better. The primary reason that our patients get dentures is to replace all or some of their teeth. Whether your teeth have been lost to poor oral health or even an accident, dentures can change your life for the better. However, the real reason that so many people opt for dentures is that they have no more confidence. If you feel that you might be one of those people without any confidence because your teeth do not look healthy, they are falling out or missing, we can help. Partial dentures are used to provide you with teeth when some are missing. These do not cover all your teeth, and they do not mean your entire smile will change. What partial dentures do is fit so that missing or damaged teeth are no longer visible and you appear to have a full, healthy smile. Partial dentures are often necessary because not allowing your teeth to look as good as they can is bad for your self-confidence, but it’s also not great for your overall health. When some teeth begin to fall out with age, you will find that you need partial dentures to help your remaining teeth last as long as possible. It’s very simple for your teeth to begin to fall out of your mouth faster when there are not teeth there to keep them intact and where they belong. Total tooth loss is devastating. There is nothing that makes a person feel as un-confident and out-of-sorts as having no teeth. Whether your teeth are missing because of an accident, poor oral health or simply age, we can help fit you with custom dentures that fit your mouth and allow you to feel more confident with your smile once again. Total tooth loss might not sound like it is all that common, but it happens more than you might imagine. Disease can kill teeth and result in all of them being pulled or falling out. Accidents can cause teeth to fall out, even all of them at times. It’s a dangerous situation in which to find yourself, and it’s one we can help you with. The first step in the denture process is a consultation. Our professional dental associates meet with patients to help them determine what they need, and what the process of getting fitted for partial or total dentures looks like. We help you understand the entire process from start to finish, including what is expected of you and how you will proceed in a situation such as this one. Your smile is important, and your confidence is just as important. Without a great smile, we know your confidence disappears and that is why we are here to help you look your best at all times. Dentures might seem intimidating, but the process is made so simple with our knowledgeable professionals. By allowing us to guide you through the process, we make the entire thing that much easier. Call us today at (607) 785-3339 to schedule an appointment to discuss the many benefits of dentures for you.